I first heard about this idea when I read The Ten Thousand Hour Mama’s list and thought it was such a lovely thing to start the year with. If you’d like to join in, here’s how it works: set a timer for 10 minutes; timing this is critical. Once you start the timer, start your list (the timer doesn’t matter for filling in the instructions, intro, etc). The goal is to write 50 things that made you happy in 2015, or 50 thing that you feel grateful for. The idea is to not think too hard; write what comes to mind in the time allotted. When the timer’s done, stop writing. If you haven’t written 50 things, that’s ok. If you have more than 50 things and still have time, keep writing; you can’t feel too happy or too grateful! When I finished my list, I took a few extra minutes to add links and photos. To join us for this project: 1) Write your post and publish it (please copy and paste the instructions from this post, into yours) 2) Click on the blue frog at the very bottom of this post. 3) That will take you to another window, where you can past the URL to your post. 4)Follow the prompts, and your post will be added to the Blog Party List. Please note: the InLinkz will expire on January 15, 2015. After that date, no blogs can be added. So here they are. 50 reasons I’m grateful and happy at the start of 2016. The Beans. Always and forever. These little guys make me laugh every single day. Mr HSS, who is the most brilliant father and as a husband, believe me, puts up with a lot. The little family unit the four of us are together. It’s pretty cool and a fun place to be. Our wider family. The practical and emotional support they give us. We would struggle without them. Just today The Beans had a great day with my parents while I was at work. Our little home. Which, yes, is not as tidy or ‘together’ as I’d like, but it is ours, and it looks after us. Lovely shiny pretty organised toy storage. Living where we do, with all the benefits of being in a city but with the coast and the forest just around the corner. The vibe on our street right now. Loads of young families and lots of great people I’m really enjoying getting to know. New adventures in a new job to look forward to. Change is exciting. That I have the kind of husband who said ‘if you’re not happy, leave’. Who was happy for me to take a pay cut – even give up completely – if that was what it took for me to be happy. That amazing buzz when everything is just going right in a classroom. That. Seeing things I’ve implemented at work starting to pay off. Knowing it was the right thing to stick with them when others weren’t sure. Eyes that work properly, having spent most of a year not being able to rely on them. 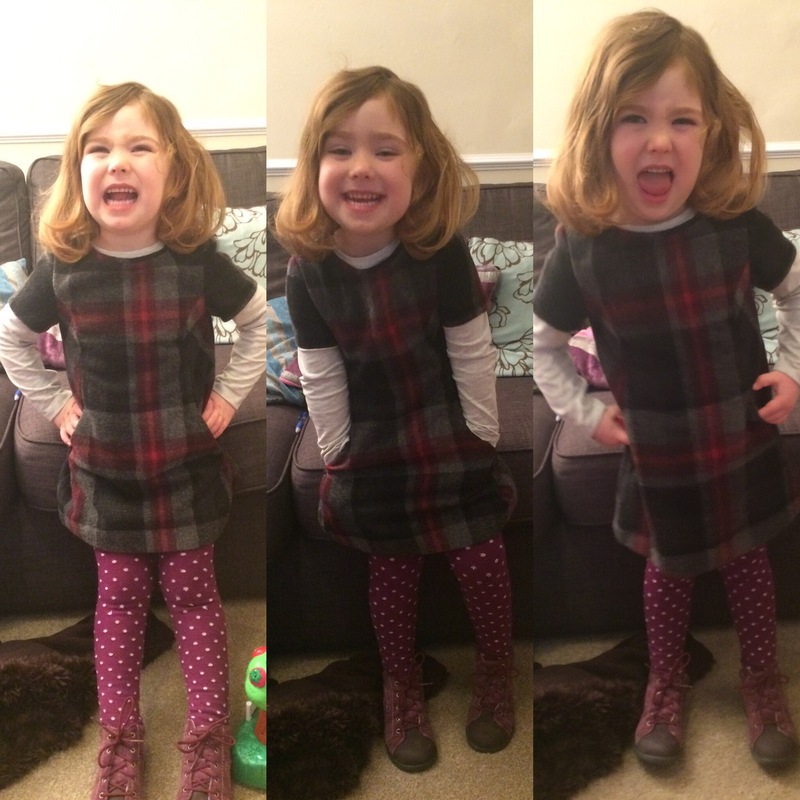 Dressing The Beans in cute and quirky outfits. A little time to myself every now and then to follow my hobbies. Cuddling on Bean1’s bed reading stories. Listening to Bean2 learning to talk. It is so cool hearing his language develop every day. My current favourites are ‘oncomeoncomeoncomeon’, ‘sit own’ and ‘nick-nam’ (stick man). Two little children walking down the street, hand-in-hand. Cuddles with Katie the cat. Being able to breastfeed. Still doing it now at nearly 21 months. That our house is filled with laughter more than any other sound. Bean1’s utter relish for life. Her passion and enthusiasm and excitement. That I truly believe she is capable of taking over the world. Bean2’s arms around my neck. A husband who still tells me I’m beautiful and fancies me when I am anything but. That we are so lucky to be able to live the comfortable life we do, with enough in the bank for the odd treat and luxury. Truly privileged. That a lady at Bean1’s ballet class complimented my children on…wait for it…their eyebrows. Which admittedly, are pretty cool. The Internet. That I can find out anything at the touch of a button. How it keeps me connected with all sorts of fabulous people. That because of it I know people I never would have met in ‘real’ life, but who I now count amongst my closest friends. Making pancakes with The Beans. iplayer. On demand tv in general. When Bean1 says ‘shall we go to a cafe for lunch today?’ And we go. Cuddles from sleeping children in the middle of the night. My health, and my family’s. That I know it is totally within my power to lose that extra stone. Painting. Playdoh. Messy play. Happy faces. Being able to lose myself in a book every so often. Bean2, yesterday, drawing a bus with great concentration and telling me who was on it. Mummy. Daddy. Memmie. Gran. Grandad. Nana. Gogo. Nick-nam (of course). Singing lullabies to my babies as they fall asleep. MrHSS’s passion and enthusiasm. For all sorts of bizarre things. Love this! So glad this gratitude is rippling out. Yes to pursuing hobbies, little arms around your neck, quirky outfits and bedtime stories! So many happy things 🙂 Thanks for your list which inspired me. Wonderful list of joyful things! So glad you joined my blog party; it’s been seriously inspiring to see all the wonderful gratitude lists! Those beans sure are adorable, and #37… for real! Glad you could make the time to share with us! Amazing!! Love them all. As a teacher and a mother, I could relate to so many!! Hehe it’s a fun life, isn’t it?! I love you. Now please stop touching me.